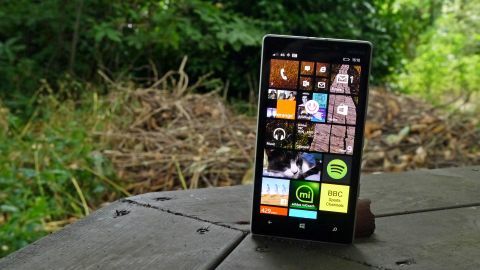 Windows Phone is going on four years old now – and it's still never had the standout phone that shows it's a platform that can compete with the iPhone and the best Android has to offer. The Nokia Lumia 930 looks to be just that phone, with a next-generation screen, a much-improved processor and a new version of the OS to give users more customisation than ever before. This is still a Nokia phone, despite the buyout by Microsoft, and the heritage is plain to see with the choice of coloured plastic backs combined with the metallic trim. But here's the key question: does the Nokia Lumia 930 have the ability to mix it with the big boys? It's got a higher spec sheet than ever before, the still-great camera and all of the Finnish / American toys it can pack on board, and it's coming out of the gate for cheaper than the competition too. On top of that you've got a decent accessory ecosystem around it, a strong identity and an ever-growing user base for Windows Phone. But there's also the other side of it: the Lumia 930 is using last year's components and still has to battle against the fact Windows Phone is still running behind iOS and Android in both the popularity and app stakes. It's a tricky one – read on to see if the new Lumia could possibly be your next phone. The first thing that you'll notice about the Windows Phone 8.1-powered device is the fact it's got a much improved screen over its predecessors. Yes, the Lumia 1520 had a large 1080p screen, but it was much bigger than the 5-inch version on show here and as such the sharpness suffered as a result. But the AMOLED ClearBlack display used on the Lumia 930 is just brilliant. I've had too many tedious arguments with others about the benefits of LCD over OLED technology (yes, such is the effervescent life of a technology journalist) but you can't argue that OLED just looks better. Whether it's the deep blacks, rich contrast or generally decent colour reproduction (which Nokia has nailed with its ClearBlack technology) the screen quality on the Lumia 930 is a really lovely experience. It makes the live tiles really stand out on the home screen, and combined with Nokia's love of colour, the whole effect is really rather nice. One of the key benefits of OLED technology is the fact that when a portion of the screen is black, it's completely switched off. This means that the disparity between bright white sections and the darker portions is more apparent, and from the moment you switch on the Lumia 930 you get the sense that this is a good quality phone. There's also the battery saving element (if a pixel is off, it's drawing a lot less power... actually, pretty much none) so that's a benefit too. I'm going to come onto the design of the Lumia 930 in the next section of this review, but it's worth talking about here as it's something Nokia is using as a real selling point for its new handset. The combination of a metallic rim and polycarbonate back is nothing new, but Nokia's bolstered the strength of the phone with this year's design, and it works pretty well. The lighter grey exterior has a very Scandinavian feel to it, and combines well with the brighter colours - although you can get black and white versions if you prefer your smartphone a bit more low key. It feels solid in the hand, but the weight and thickness is pretty hefty for a 2014 flagship smartphone... it's hard to work out why Nokia has increased things here, but it's definitely a design that stands out from the crowd and offers a very well-built phone. Again, I feel like I'm ruining a later section, but the update to Windows Phone is a key selling point of the Lumia 930, at least in the early days of sale. There aren't a huge amount of phones packing the update at this point, and users will benefit from new elements like a notification area (Action Center), more options with the background wallpaper and more live tile options than ever before. Sadly, in the UK there's no look at Cortana yet, but that will be coming pretty soon we're told, and that will offer some decent access to one of the best voice assistants on a smartphone. Windows Phone 8.1 pushes the OS forward by a huge amount - it was sorely needed, and doesn't quite get it up with the best, but just a little bit closer. Nokia's Lumia 930 is a good poster boy for this, and the combination of power and design gives a good experience under the finger. Nokia's camera heritage has been a mainstay of the mobile phone for nearly a decade now, since the decision to stick a snapper on the back of a handset. With Pureview Nokia's really owning this space, with the Lumia 1020 still arguably the best camera-on-a-phone out there (not the best cameraphone, as what's running underneath is sub par). The Pureview sensor on the Lumia 930 is similar to that seen on the Lumia 1520, which is a shame, as I was really hoping for something really advanced and could allow me to stop carrying the 1020 around with me. It's not in the same league as the 41MP sensor on that device, but it's still very much one of the best on the market, as you'll see with the later camera samples. Another of Nokia's big strengths is the Here suite of products that it bundles with the Nokia Lumia range - and will probably be completely available on all Windows Phone devices in the future if Microsoft has anything to say about it. The big hitters are Here Maps and Mix Radio in my opinion - the former being a big win because of the ability to take maps offline as well as relevant information being spread throughout the app. It's a much better app than it used to be too - while you still need to download plugins to make it fully functional, at least those extra bits are now available. It allows for easy mapping and is arguably a more coherent sat nav option than those from Apple or Google, which you should note if you're one to use your phone to navigate around in the car. However, it's still not up to the standard of Google Maps, either in interface or general functionality. What you gain in offline capability and relevant information you lose in general interface - the slower way of flicking through the map (even with the extra grunt of the quadcore Snapdragon 800 chip running under the hood) shows that this is still something that needs more work to be a real competitor. Mix Radio is an interesting proposition though. The idea is that it forces new music onto you (and for free, which is brilliant) and even lets you sync offline without paying any more. The range of genres and pre-mixed playlists is really something, and despite downloading Spotify as well (which needs a lot more work on Windows Phone) I found myself initially drawn to this app to see what was on offer music-wise. However, it didn't take long to start to fall out of love, as it relies heavily on a connection most of the time, and if you go underground or on a train with low signal it can really upset the functionality of the app. This means that the playback won't work over and over again despite being able to connect, and if you've part-downloaded a playlist it will confuse the life out of the app. You can pay £3.99/$3.99 per month and get better access to the features of the app, such as improved audio quality and unlimited skips through songs, but it's not really that much better than the free version. Plus you need to sign up through a Nokia account (you can do it through a Microsoft login, but that's not quite integrated yet, which leads to an email asking you to sort out a Nokia account still) which seems a bit last century nowadays. There are plenty of decent apps from Nokia and Microsoft to download (or are pre-installed on the phone) that really add to the functionality though - everything from Video Tuner (which allows you to easily make more shareable videos) to Nokia Beamer (an awesome app that lets you mirror your phone screen on any internet-connected device in the world) so at least the Windows Phone experience is working hard at its own apps to make the experience more enticing. Nokia needs to work out what it really wants when it comes to wireless charging. Enabled in the Lumia 920, it's been stripped out of subsequent light-named smartphones. It's back in the Lumia 930, and as such adds a huge amount of heft to the design, apparently. I get that Nokia decided to let it be an option extra in recent models, in the shape of a snap-on case, as that gave consumers choice. Sadly, it seemed that they chose to not use it, so Nokia has made it mandatory once again. It's great to see, and even better that there's a wireless charging pad in the box - THAT'S what consumers need to make wireless charging happen. However, I don't get why it's added so much depth to the phone (assuming that's the reason), as other models, such as the LG G3, can manage it in a very slim profile. But overall wireless charging being part of the set up is a big, big win. Not needing to plug your phone in for the first time as you put your head on the pillow is really awesome - this is the kind of futuristic stuff I was expecting years ago.